This is part one of a several part guest series on the hidden side of Barack Obama's former Trinity United Church of Christ in Chicago. The author Max Friedman is an expert on the US far left, in which he worked undercover in the late 1960s and 1970s. Friedman has testified before US Senate internal Security hearings, has contributed to several books and has written numerous columns and articles. This is by far the most comprehensive examination of Obama's church to date. Sen. Barack Obama, his wife Michelle, and later his children, attended the Trinity United Church of Christ in Chicago for close to 20 years, yet when inflammatory tapes of its infamous Rev. 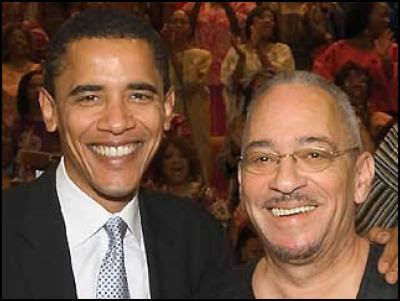 Jeremiah Wright surfaced off it's own website, the Messiah-in-Waiting didn't say anything for a long time. Finally, when pressed, he said that White's statements were disturbing and that this wasn't the Rev. Wright he knew (i.e.the man who had married him to Michelle, baptized his daughters, and whose sermons he listened to several times a month. This was also the man whose sermon became the title of Obama's second book, "Audacity of Hope" in which the Reverend was mentioned a number of times. So what else didn't he know? Apparently a lot, or he had been avoiding, omitting, distorting, and just plain lying about nearly everything connected to the Rev. Wright and Trinity United Church of Christ. For starters, Obama has lied about knowing the real ideological extremism of Wright and "black theology", a hybrid form of marxism and black nationalism which centers around reparations, extreme ethnocentrism, and disguised racism (until Rev. 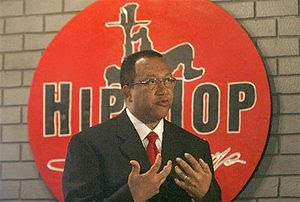 Wright's speeches started to be heard on the Sean Hannity Show and seen on various internet sites). For a very good summary of the "Black Liberation Theology" concepts that guided Rev. Wright and some other black clergy/churches,, as written by racist extremist Dr. James Cone in his book "Black Power and Black Theology", see Joshua Muravchik's article "Obama's Leftism" in the October 2008 issue of "Commentary Magazine"
It was not widely known in the white world, or even in the general American populace, that the not-so-right Reverend was the leader of a Black extremist church which supports white reparations to American blacks because of slavery. However, two good columns by veteran writer Cliff Kincaid addressed this issue, the first on March 3, 2008, at Small government Times in a piece entitled "Does Obama favor slavery 'reparations? '", and a more detailed column in the "Accuracy In Media (AIM) Bulletin" of April 21, 2008. This second column, entitled "Obama and the Drive for Slavery Reparations", provides a great amount of details about what was not generally known about Wright and his church concerning this issue. Some of the people mentioned in this article have been associated with marxist groups including the Democratic Socialists of America and the Republic of New Africa (once a violent Maoist group), other black extremist groups, and have had contact with foreign governments, movements, and America-haters. While in and of itself, this is not too surprising to those who have followed the far-left movements in the US over the past 40 years, what is of concern is who Wright and other leaders of that particular church have been associating with over the years that the Obamas were members. 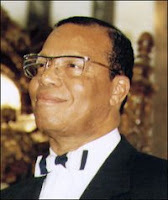 We know almost nothing of Wright's teaching trip to Cuba in 1984 "to teach Christians about the value of nonviolent protest" and his trip with Nation of Islam leader Louis Farrakhan, the black extremist, racist, anti-semite and cult-figure, to Libya in a gesture of support to Libyan dictator Muammar Kadafi (Qaddafi) in 1984 and 1987. (The first trip was loaded with black extremists and communists, though no complete list or story about those individuals appeared in a search of the internet). However, the ever vigilant "Information Digest" of Aug. 3, 1984, did a three-page story on "Cuba Courts the Black Churches" concerning the visit of June 1984 Rev. Jesse Jackson and some 300 black church leaders to Cuba. Among those who went there was the Rev. Benjamin Chavis (then the director of the Commission for Racial Justice (CRJ) of the United Church of Christ, as well as a leader of the CPUSA front, the National Alliance Against Racist and Political Repression (NAARP), the successor to the Angela Davis Defense Organization/Committee, who later headed the NAACP before being ousted, and who finally ended up converting to being a Black Muslim with NOI leader's Louis Farrakhan. 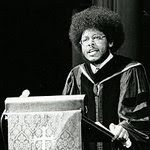 Others included the gamut of the black church spectrum from moderates to marxists to black theology proponents including James Cone, Union Theological Seminary (UTS), the author of the key book on "Black Liberation Theology" to which Rev. Wright and his church subscribe. Jackson gave his usual praise for Cuba, "an all out struggle against war and for peace" and a lot that the western press never published. His fondness for supporting communist and Middle Eastern dictators would fill a small book, but some good older material can be found at the conservative weekly "Human Events" and the internal security newsletter "The American Sentinel" (for whom I was a reporter/editor. "AS" also included a lot on Jackson's top foreign affairs aide, longtime identified CPUSA organizer and suspected Soviet agent-of-influence Jack O'Dell, aka Hunter Pitts O'Dell, aka Jack Vesey). The Rev. Wright was quoted as having said "Since speaking to Raul Suarez in Nicaragua this March about this conference, I have been looking forward to coming to Cuba to enter into this dialogue with the Christians here. The Seminar met all my expectations, and in fact, surpassed many of them. "I have been affiliated with the Cuban Council of Churches since the 1980s," and that "I have several close Cuban friends who work with the CCH and you have heard me preach about our affiliation and the Black Theology Project's trips to Cuba." He also reported said: "Our denomination's Global Ministries is committed to calling for an end to the U.S. sanctions against Cuba." The article said that the Cuban Council of Churches was descrivbed by a Cuban intelligence officer defector, Juan Vives, as "an arm of Cuba's ICAP (Instituto Cubano de Amistad con los Pueblos) itself an arm of Cuba's DGI, Cuba's secret police, founded and mentored by the KGB and East German STASI." One long-time ICAP chief, Rene Cruz Rodriquez, was identified in the article as a major Castro executioner, and that he was indicted on Nov. 5, 1982 by a grand jury in Florida for "drug smuggling." The official Cuban newspaper "Granma" was quoted in the ID article of 8/3/84 as saying that the conference talked about many things concerning racism, social justice and civil rights in the U.S. and that "Other important subjects discussed were the history of black religion in the United States, the work of theologists in the Caribbean, theology and Marxist analysis, black liberation theology and the significance of the life and work of Martin Luther King for Cuban Churches." So besides supporting terrorist/dictator Muammar Qaddafi during his several trips to Libya with Rev. Farrakhan, Wright was also a friend of Communist Cuban and the marxist Sandinista regime in Nicaragua where religion was led by marxist Jesuit priest Fr. Miguel D'Escoto, now a leader of one of the United Nation's key organizations. The the Trinity United Church in Chicago had its reverend up to his ears in friendly relations with the Communist butchers of Havana, Managua, and Qaddafi in Libya, all in one year. Not a bad day's work. The Church's motto of "Unashamedly Black and Unapologetically Christian" seemed to have left out and "we are also supporters of anti-semites, terrorists and communists here and abroad." "The Farrakhan-Wright connection is no distant matter of the turbulent '80s. Farrakhan, Wright and the church have remained in close contact until this very day. As recently as December 2007, the church's publication bestowed upon Farrakhan its highest honor, the Dr. Jeremiah A. Wright Jr. Trumpeter Award for Lifetime Achievement." There was also a report that Wright accompanied Rev. Jesse Jackson to Lebanon and Syria to "free" a captured US pilot who was shot down during the fighting there in 1983 That trip really needs to be examined in great detail because it may have been the result of a Soviet KGB operation and operative. "Black theology of liberation: Hopkins educates church leaders, expands scope of scholarship"
I have also heard Wright mention Cones as well. I heard him ask Sean Hannity if he read any of Cones books.